Ah, the second of the Holy Trinity of Pizza. Notice I didn’t qualify “pizza” with “New Haven” or “Connecticut” or “American” or even “Worldwide.” That’s because as everyone who knows anything about the pizza arts knows that the greatest pizza in the world can be had in our very own New Haven, Connecticut. Why? There are many stories how this fact came to pass, but it usually always centers around Frank Pepe who opened Pepe’s in New Haven in 1925 (CTMQ’s visit to Pepe’s here). He got things going with his thin crust brick oven pizza (also used at Modern and the third of the Trinity, Sally’s) and solidified his stature with the invention of his white clam pizza. Period. Don’t argue… Especially if you’re from anywhere other than Italy, New York City or Connecticut. When I travel home (to Delaware) or anywhere else and someone tries to foist some local pizza on me, it’s all I can do to choke it down. And if you happen to enjoy that sloppy glop they eat in Chicago, please, I beg of you, see a shrink immediately and get off my blog. Now that we’ve gotten rid of the riff-raff around here, let’s get down to business. 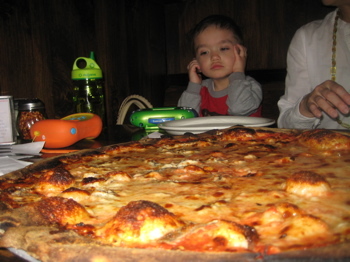 The serious business of New Haven pizza. There’s a subtle joke ‘round these parts that Modern is the best of the Trinity simply because it’s the only one open for lunch and even at dinner time, it’s often the only one with a wait less than two hours. Yeah that’s right… New Haven pizza (at least Wooster Street pizza) is so freaking good that they don’t even bother with the lunch crowd. 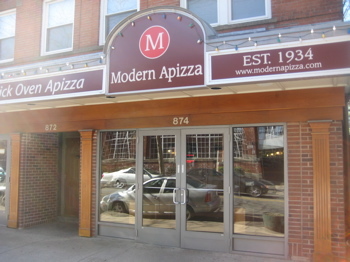 Originally called State Street Apizza, Modern Apizza was founded in 1934 and has been in the same spot ever since. Unlike Frank Pepe Pizzeria Napoletana and Sally’s Apizza, the other well-known New Haven pizzerias, Modern Apizza is not located on New Haven’s famous Wooster Street but rather on nearby State Street. I suppose a quick explanation is in order for those of you unfamiliar with “apizza.” New Haven-style pizza, locally known as apizza, is a style of Neapolitan pizza common in and around New Haven. 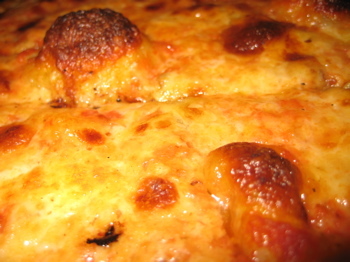 It originated at the Frank Pepe Pizzeria Napoletano and is now served in many other pizza restaurants in the area, most notably, Sally’s Apizza, Bar Bru Room, Grand Apizza, Sal’s Apizza, and Modern Apizza. This geographically-limited pizza style has gained considerable culinary and historical importance. Basically, what Wikipedia is trying to say is that it’s the best pizza in the world. 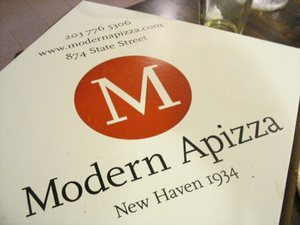 In a blind taste test conducted by two Yale University undergraduates in 2008, Modern Apizza finished in first place ahead of five other New Haven pizzerias. 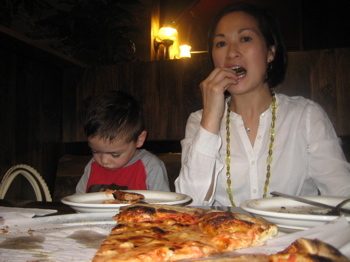 It has also won the New Haven Advocate’s Best of Reader’s Poll for “Best Pizza” nine years in a row. Well, well. I had never been to Modern before, but have noticed that it’s sort of the “cool” one to like of the Trinity. And I’m sure a bunch of those votes in that reader’s poll ARE given because Modern has more open hours. It’s cliché at this point to love Pepe’s. Well, I’m certifiably cool and I love Pepe’s. So there. But I was more than willing to love Modern too, so Hoang, Damian and I hit it up one afternoon with empty bellies and eager tastebuds. While there are many connoisseurs of pizza who will fight us on this point, we do not believe that Modern Apizza of New Haven serves the best pizza on earth. 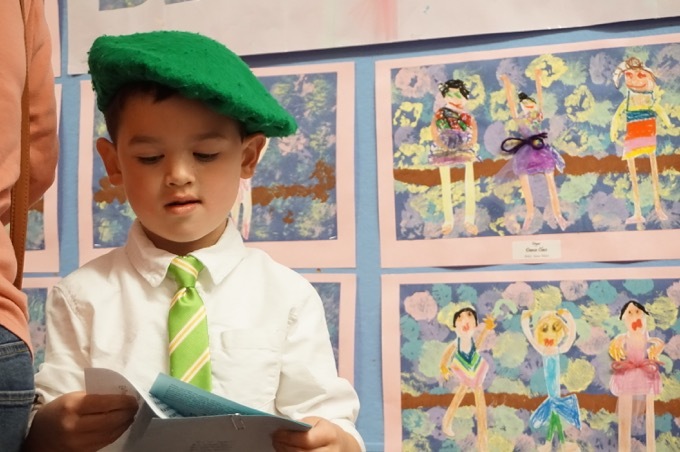 In our book, it is only the second best on earth, after Pepe’s of New Haven … except on those days when Pepe’s has no clams for its white clam pizza, in which case we will gladly go to eat white clam pizza pie at Modern. Let us say it plainly: Modern Apizza is a fantastic four-star pizza parlor, and if you eat here rather than on Wooster Street, it’s about like winning only $100 million rather than $125 million in the Power Ball. As for the New Haven favorite, white clam pizza (hold the mozzarella, please) Modern uses pre-chopped clams rather than freshly shucked ones, meaning there is less soulful marine juice to infuse the pizza; nevertheless, it is delicious – ocean-sweet and powerfully garlicky, and built on a crust that puffs up dry and chewy around the edges, but stays wafer-thin all across the middle. “Our brick oven reaches temperature in excess of 700 degrees,” Modern’s menu warns. “Some pizzas may blacken around the edges, and even lose their perfect shape due to contact with the brick floor of the oven.” Ok with us! While a few places around the edge may be charred, the whole pizza has a swoonfully appetizing smoky taste; and you see why when you devour slices off the paper on which the pizza rests atop its round pan. 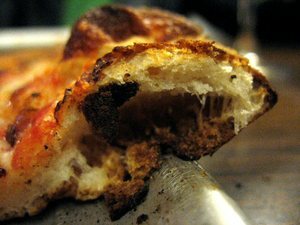 The paper appears strewn with charred little bits of semolina from the oven floor, most of which cling to the underside of the crust, creating a slightly burnt hot-bread flavor that no wussy metal-floored pizza oven could produce. Modern’s specialty toppings include broccoli, sliced tomato, artichoke, and clams casino, which is clams, bacon, and peppers. It is also known for the Italian Bomb, which is a joy to eat despite the fact that it totally overwhelms its crust: sausage, pepperoni, bacon, peppers, onions, mushrooms, and garlic. There is also a Vegetarian Bomb topped with spinach, broccoli, olives, peppers, mushrooms, onion, and garlic. One other reason we love Modern, sometimes even more than our beloved Pepe’s: it is open for lunch! Pretty much what I’ve already said. I didn’t know Michael Stern used words like “wussy…” But good for him. We arrived mid-afternoon and immediately found an empty booth. The ambiance here is sort of like your uncle’s darkened den, with faux-brick walls, those tacky orange tinted lamps and pleather banquettes. It was crowded, but there was no wait. +1 for Modern. Here’s where we went a little wrong. Hoang and I actually like anchovies on our pizza. Note that Roadfood did not mention that Modern’s anchovy pie was top-notch, but “whatever,” we thought, “we like anchovies.” We ordered a large; half with the fish, half just plain cheese so a) Damian could enjoy some and b) we could taste the true plain Modern pie. Modern’s pizzas are beautiful. Blackened thin crusts and huge singled bubbles of cheese. Unfortunately, the anchovies they used on the day we visited were way, way too salty. Of course all anchovies are salty, but our pizza was almost too much. It’s not even that they put on too many fish either, it was just that the darn thing was a salt mine. Over on the cheese-only side, things brightened up considerably. The crust was, as is almost always the case among the Trinity, perfect. Chewy – but not too chewy – and flavorful. Please don’t misunderstand me: A “bad” pizza at Modern is still way better than any pizza you’ll find outside of NY and the northeast. Heck, it’s still better than most pizza anywhere else in Connecticut. But sadly for us, our choice rendered us a bit disappointed. On the plus side, Modern serves local Foxon Park sodas and that’s always a good thing. Also, Modern actually tries to be polite and give good service. The other joints over on Wooster Street not only don’t care about your lunch needs, they also often couldn’t care less about customer service. Perhaps because they don’t have to. I think I’ll have to go to Modern again someday and get one of the recommended pies. Or maybe go a few time just to be sure I’ve got it right. It would only be fair. I honestly haven’t had any of them for well more than a decade, but my father (born and grew up in New Haven) always was a Modern guy. ha. I dig that picture for a couple reasons (it was taken walking out of Modern back to the car.) It’s like an album cover. It has a shell of an old pay phone. It has a Marlboro price half of what they cost now. Hoang’s hair hides her face adding mystery. But really, she’s jsut carrying some leftover pizza. 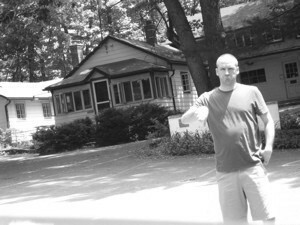 I thought it was a very Beatles-esque picture! for utter convenience modern ranks first. however, you must try sallys. avoid college related “event days” but do go closer to closing time. we’ve gotten good at it…in and out of sallys in 50 mins with fully bellies and leftover pizza. I’m glad that you mentioned Grand Apizza, open for lunch, never a line, and defintely compares to Wooster St. one of my favorites. We were regulars there for years. They’ll even sell you some dough to take home.